We had such a fun Easter weekend this year. 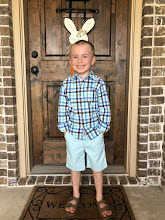 Parker was running a fever the day or two before Easter, so I was a little unsure if we would be able to enjoy all of our plans, but he woke up Saturday morning with no fever and feeling like himself - hooray! On Thursday, we made up goodie bags for all of our neighbors...20 bags. 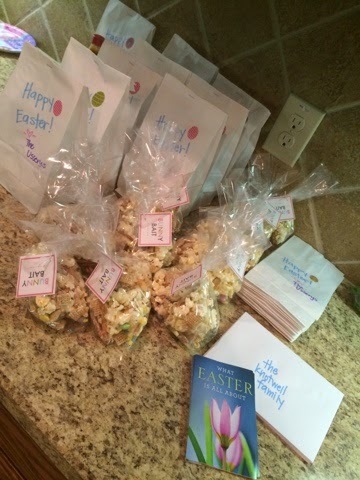 We included an Easter card, an Easter booklet with an invitation to church on Sunday and a snack mix called "Bunny Bait" - it had popcorn, pretzels and rice chex covered in white chocolate and then we added sprinkles and M&Ms at the end. We delivered them over the weekend. We love spreading holiday cheer! On Saturday morning, John did all of the yard work so the yard would be looking good for the rest of the weekend. While mowing, he found a baby bunny. Parker had to come see it for himself in his pajamas. From the Ussery family to you HAPPY EASTER! We are headed to church this morning, but will share pictures from our Easter weekend soon. These are a few we took a couple of weeks ago of our sweet, handsome boy!